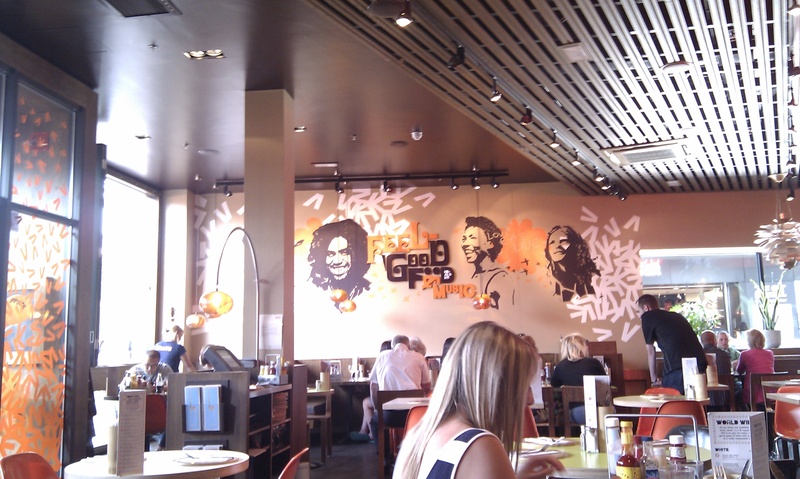 Giraffe is a chain of restaurants owned by the founders Juliette and Russel Joffe and Andrew Jacobs. The first one was opened in Hampstead in 1988 and 20 years later the 36th outlet was opened in Bristol at Cabot Circus. The bright interior still remains orange and friendly on the third floor of the shopping centre and their selections have remained rather varied. On a warm and sunny Saturday I visited for lunch with a friend and hoped for a relaxed and healthy meal. 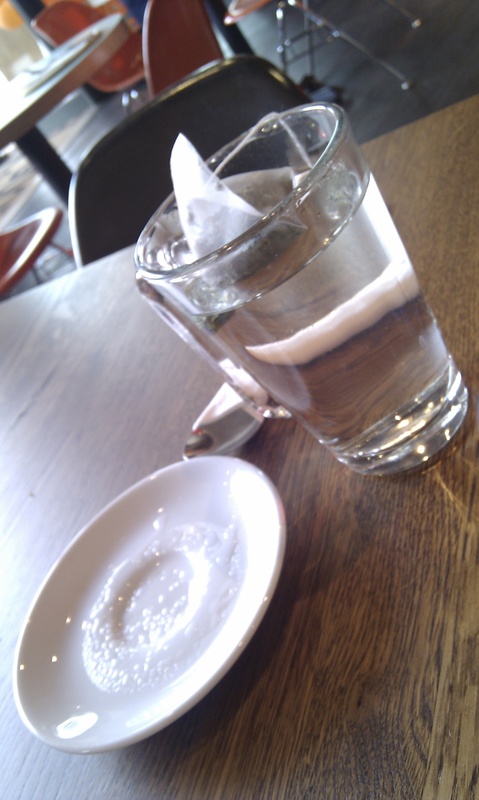 We both ordered mint tea and the tea bag was brought on a little plate resting on a glass cup of hot water. £1.90. We ordered marinated olives and pickles as a starter and were brought a small dish full of green olives and pickled onions. £2.65. 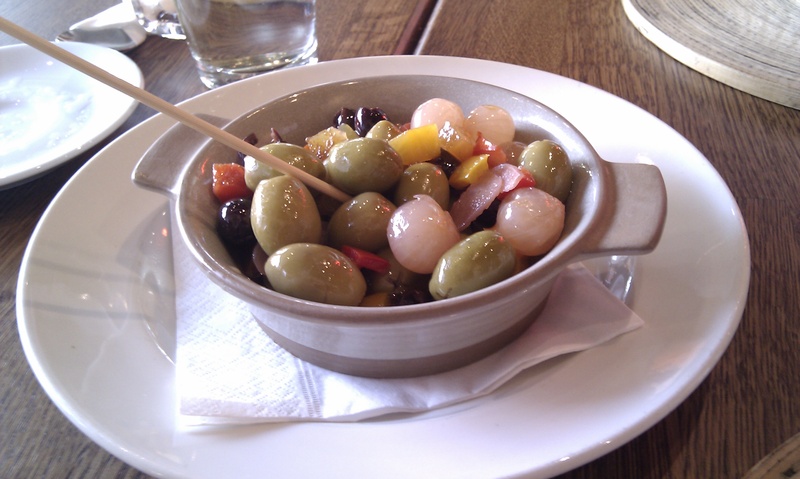 The olives did indeed taste marinated and delicious, the dish was colourful and fresh tasting, really lovely. My friend ordered the deluxe falafel burger which was served with grilled pepper, hummus, beetroot, rocket, halloumi, tzatziki & harissa. £9.50. It was served with skin on fries. The chips were gorgeous and I think I loved them more than he did. I regretted not ordering them as a side but was quite happy with my meal. 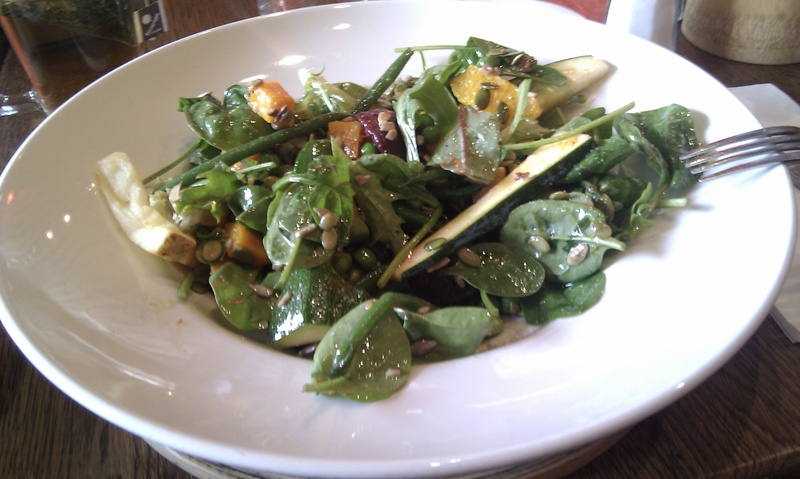 I ordered the ‘Bronte Beach’ Summer Salad and it was made up of spiced roast pumpkin, edamame beans, spinach, beetroot, zucchini, green beans, peas, freh orange & toasted seeds in our golden balsamic dressing. It was nice and I liked the healthy feeling of it but I did have to add salt as it was a little under seasoned. £8.95. A 10% optional service charge was already added to our bill and it came to £27.95. The only thing that could have improved it was more chips but that will have to wait until next time. 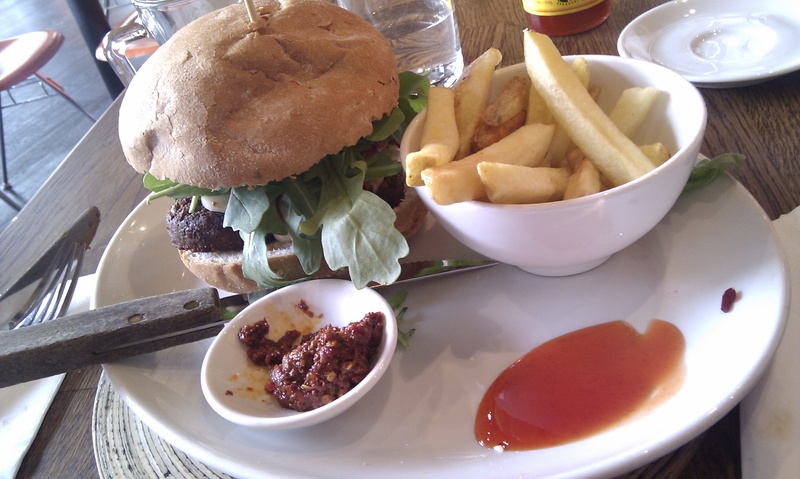 This entry was posted in Bristol, Food, Restaurants and tagged Bristol, Bristol restaurants, Cabot Circus, chips, Giraffe restaurants, healthy food. Bookmark the permalink.